Las tecnologías de la información han transformado las organizaciones, por lo cual identificar su valor empresarial ha sido una de las principales inquietudes de directivos e investigadores. El objetivo de esta investigación es determinar la influencia de la calidad de los sistemas de información y su impacto en los usuarios en su uso/utilidad en las pequeñas y medianas empresas en la región noreste de México. Se aplicaron 169 cuestionarios y analizados con Mínimos Cuadrados Parciales (PLS por su sigla en inglés) y el Análisis Multi-Grupo (MGA). Los resultados indican que los usuarios están satisfechos con la calidad de los sistemas, pero no les permite un mejor uso y utilidad. Con el MGA se detecta una diferencia significativa en la relación de beneficios percibidos y calidad del sistema. Bailey, E., Pearson, W. (1983). Development of a tool for measuring and analyzing computer user satisfaction. Management Science, 29(5), 530-545. Ballantine, J., Bonner, M., Levy, M., Martin, A., Munro, I., Powell, P. (1996). The 3-D model of information systems success: the search for the dependent variable continues. Information Resources Management Journal, 9(4), 5-14. Ballou, P., Tayi, K. (1999). Enhancing data quality in data warehouse environments. Communications of the ACM, 42(1), 73-78. Bokhari R. (2005). The relationship between system usage and user satisfaction: a meta-analysis. The Journal of Enterprise Information Management, 18, 211-234. Bradley, R., Pridmore, J., Byrd, T. (2006). Information systems success in the context of different corporate cultural types: an empirical investigation. Journal of Management Information Systems, 23, 267–294. Carr, C. (2002). A psychometric evaluation of the expectations, perceptions, and difference-scores generated by the IS-adapted SERVQUAL instrument. Decision Sciences, 33, 281–296. Chen, L., Soliman, K., Mao, E., Frolick, M. (2000). Measuring user satisfaction with data warehosues: an exploratory study. Information & Management, 37(3), 103-110. Chin, W. (1998a). Issues and opinion on Structural Equation Modeling. MIS Quarterly, 22(1), 7-17. Chin, W. (1998b). The Partial Least Squares approach to Structural Equation Modelling. In: G.A. Marcoulides (ed.). Modern Methods for Business Research (pp. 295-336). Mahwah, NJ: Lawrence Erlbaum Associates, Publisher. Choe, J. (1996). The relationships among performance of Accounting Information Systems, influence factors, and evolution level of information systems. Journal of Management Information Systems, 12(4), 215-239. DeLone, W., McLean, E. (1992). Information systems success: The quest for the Dependent variable. Information Systems Research, 3(1), 61-95. DeLone, W., McLean, E. (2003). The DeLone and McLean Model of Information Systems Success: A ten-year update. Journal of Management Information Systems, 14(9), 9-30. Derksen B., Luftman, J. (2013). Management and Technology Trends for IT Executives. Compact_ International Magazine, 4, 6-15. Falk, R., Miller, N. (1992). A primer for soft modeling. Akron, Ohio: The University of Akron Press U.S.A.
Ferreira, R., Cherobim, A. (2012). Impacts of investments in it on the organizational performance of baking companies of minas gerais state: a multicase study. Revista de Administração e Contabilidade da Unisinos, 9(2), 147-161. Fornell, C., Larcker, D. (1981). Evaluating structural equation models with unobservable variables and measurement error. Journal of Marketing Research, 18, 39-50. Gable, G., Sedera, D., Chan, T. (2008). Re-conceptualizing information system success: The IS-Impact Measurement Model. Journal of the Association for Information Systems, 9(7), 377-408. Gefen, D. (2000). It is not enough to be responsive: The role of cooperative intentions in MRP II adoption. The Data Base for Advances in Information Systems, 31(2), 65-79. Gorla, N., Somers, T., Wong, B. (2010). Organizational impact of system quality, information quality, and service quality. Journal of Strategic Information Systems, 19, 207–228. Hair, J., Hult, G., Ringle, C., Sarstedt, M. (2014). A Primer on Partial Least Squares Structural Equation Modeling (PLS-SEM). Thousand Oaks: Sage. Halawi, L., McCarthy, R., Aronson, J. (2007). An empirical investigation of Knowledge Management Systems´ Success. Journal of Computer Information Systems, 48(3), 121-135. Henseler, J., Dijkstra, T., Sarstedt, M., Ringle, C., Diamantopoulos, A., Straub, D., Ketchen, D., Hair, J., Hult, G., Calantone, R. (2014). Common Beliefs and Reality about Partial Least Squares: Comments on Rönkkö & Evermann (2013). Organizational Research Methods, 17(2), 182-209. Hu, L., Bentler, P. (1999). Cutoff criteria for fit indexes in covariance structure analysis: Conventional criteria versus new alternatives. Structural Equation Modeling: A Multidisciplinary Journal, 6(1), 1–55. Ives, B., Olson, M., Baroudi, J. (1983). The measurement of user information satisfaction. Communications of the ACM, 26(10), 785–793. Johnson, M., Herrmann, A., Huber, F. (2006). The evolution of loyalty intentions. Journal of Marketing, 70(2), 122-132. Lee, S. (2001). Modeling the business value of information technology. Information & Management, 39, 191–210. Mahmood, M., Mann, G. (2000). Special issue: Iimpact of information technology on organizational performance. Journal of Management Information Systems, 17, 3-10. Marble, R. (2003). A system implementation study: Management commitment to project management. Information & Management, 41(1), 111-123. McGill, T., Hobbs, V. (2003). User-developed applications and information systems success: a test of DeLone and McLean’s model. Information Resources Management Journal, 16(1), 24-45. Medina, J.M., Chaparro, J. (2007). The impact of the human element in the information system quality for decisión making and user satisfaction. Journal of Computer Information Systems, 48(2), 44-52. Medina, J., Lavín, J., Pedraza, N. (2011). Seguridad en la administración y calidad de los datos de un sistema de información contable en el desempeño organizacional. Contaduría y Administración, 57(4), 11-34. Nelson, R., Todd, P. (2005). Antecedents of information and system quality: An empirical examination within the context of data warehousing. Journal of Management Information Systems, 21, 199–235. Nunnally, J. (1978). Psychometric theory. New York: Mc Graw-Hill. Petter, S., DeLone, W., McLean, E. (2008). Measuring information systems success: models, dimensions, measures, and interrelationships. European Journal of Information Systems, 17, 236–263. Petter, S., DeLone, W., McLean, E. (2013). Information systems success: the quest for the independent variables. Journal of Management Information Systems, 29(4), 7-62. Rai, A., Lang, S., Walker, R. (2002). Assessing the validity of IS vuccess models: An empirical test and theoretical analysis. Information Systems Research, 13(1), 50-69. Ringle, C., Wende, S., Becker, J. (2014). SmartPLS 3 Hamburg: SmartPLS. Retrieved from http://www.smartpls.com. Rodríguez, S., Pérez, D., Bernal, J. (2014). Influencia de la implementación del sistema de información sobre el rendimiento en pequeñas y medianas empresas: un estudio empírico en Colombia. 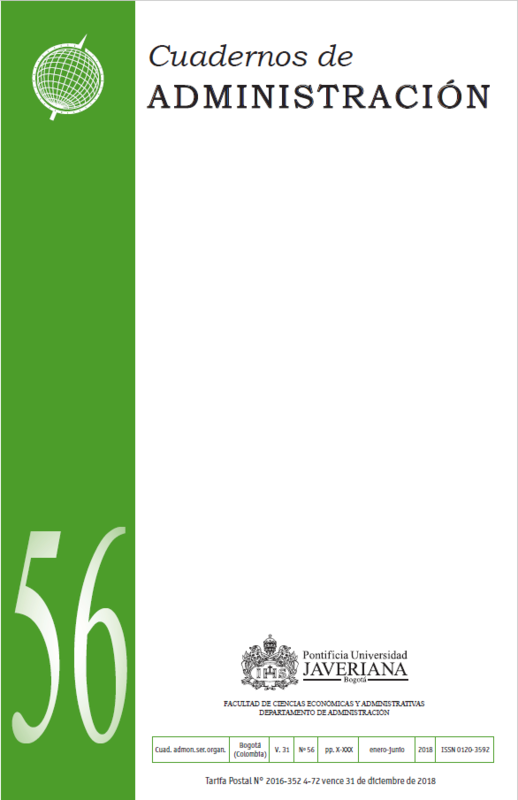 Cuadernos de Administración, 30(52), 31-43. Roldan, J., Leal, A. (2003). A validation test of an adaptation of the DeLone and McLean's Model in the Spanish EIS field. In: J. Cano (ed. ), Critical reflections on information systems: A systemic approach (pp. 66-84) Hershey, PA: Idea Group Publishing. Sabherwal, R., Jeyaraj, A., Chowa, C. (2006). Information system success: Individual and Organizational Determinants. Management Science, 52(12), 1849-1864. Seddon, P. (1997). A respecification and extension of the DeLone and McLean model of IS success. Information System Research, 8(3), 240-253. Sedera, D., Gable, G. (2004). A factor and structural equation analysis of the enterprise systems success measurement model. Twenty-Fifth International Conferences on Information Systems, Washington, D.C.
Sellin, N. (1995). Partial least square modeling in research on educational achievement. In: Wilifred Bos and R.H. Lehmann (eds.). Reflections on Educational Achievement (pp. 256-267) New York, USA: Waxmann Munster. Shin, B. (2003). An exploratory investigation of system success factors in data warehousing. Journal of the Association of Information Systems, 4, 141-168. Swanson, B. (1997). Maintaining IS quality. Information and Software Technology, 39, 845-850. Tait, P., Vessey, I. (1988). The effect of user involvement on system success: A contingency approach. MIS Quarterly, 12(1), 91-108. Taylor, S., Todd, P. (1995). Understanding information technology usage: A test of competing models. Information Systems Research, 6(2), 144-176. Turban, E., Volonino, L., Wood, R. (2013). Information technology for management: Advancing sustainable, profitable business growth. USA. 9th edition: John Wiley & Sons. Yoon, Y., Guimaraes, T. (1995). Assessing expert systems impact on users' jobs. Journal of Management Information Systems, 12, 225-249. Watson, R., Pitt, L., Kavan, B. (1998). Measuring information systems service quality: Lessons from two longitudinal case studies. MIS Quarterly, 22, 61-79. Wixom, B., Todd, P. (2005). A theoretical integration of user satisfaction and technology acceptance. Information Systems Research, 16(1), 85-102. Wixom, B., Watson, H. (2001). An empirical investigation of the factors affecting data warehousing success. MIS Quarterly, 25(1), 17-41. Wu, J., Wang, Y. (2006). Measuring KMS success: A respecification of the DeLone and McLean’s model. Information & Management, 43, 728–739.